Our October meeting will be dedicated to creating a new supply of beautiful Memory Boxes for hospitals that request them for their bereavement programs. A presentation about the history of the program, and how the hospitals use the painted boxes in gift baskets for grieving families. Also, the journey of a Memory Box from purchase to delivery. Memory Boxes to paint( boxes were available at the September Chapter meeting. If you have some at home please base coat them in colors of your choice. (Pastels work well). We will try to provide enough base coated boxes for members who were not at the September meeting. Printed instructions for prepping and finishing the Memory Boxes. Your base coated Memory Boxes, Tracing paper we will have at least 5 patterns....bring lots of tracing paper & carbon paper to transfer patterns, Stylus to trace patterns, assorted brushes, and a liner will be all you need for many of the patterns. Water basin, paper towels, tape, your choice of paints. Most patterns subjects are florals. You are encouraged to bring your own patterns to use and share and a Smile. This will be a relaxing paint in. Assistance will be provided if requested. 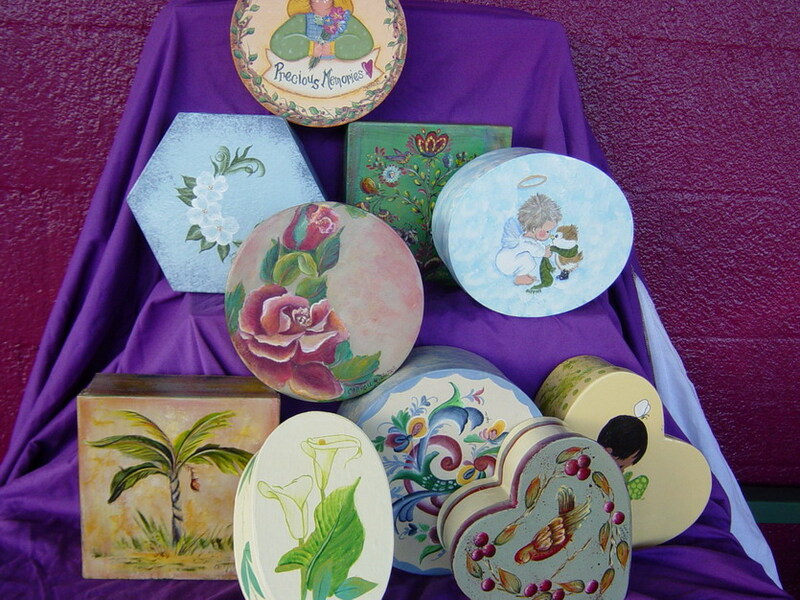 Pictured Below are Memory Boxes that have been painted in the past.